Hearty chickpeas are baked in a rich tomato sauce and topped with creamy ricotta. Enjoy as is or added to avocado toast for a quick lunch! Creamy baked beans over sourdough toast with avocado. This little number shows the milage you get just by repurposing one meal into another with the simple addition of toast. 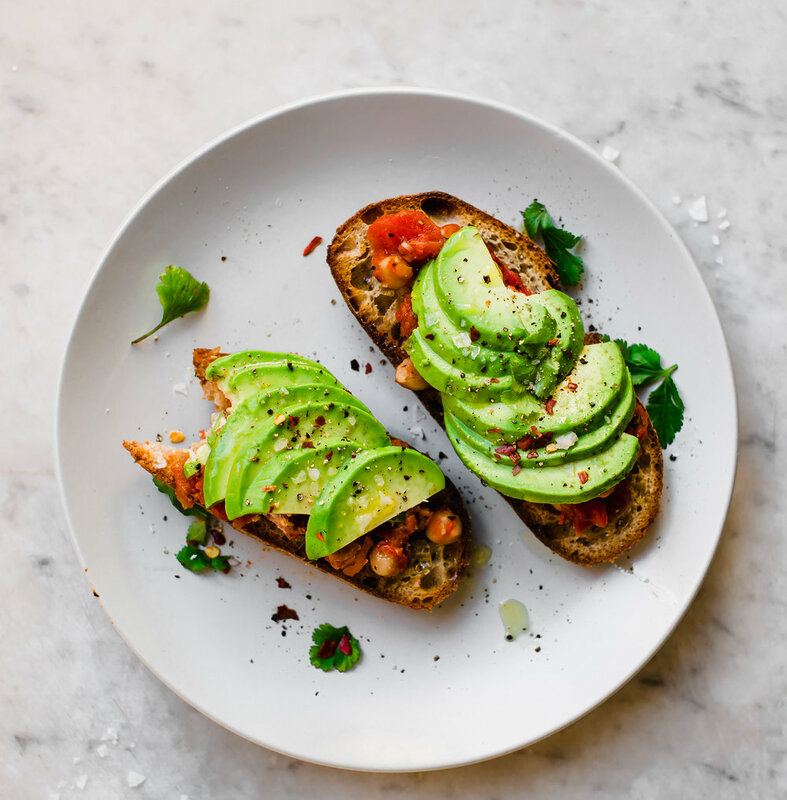 Toast - with its delicious yet neutral flavor, is the perfect vehicle, soaking up all the lingering flavors and acts as an edible spoon, gathering up the last morsels of a meal. And man does it do it justice here! Creamy beans are cooked down into a rich tomato sauce, topped with ricotta and parsley for an Italian twist on a classic dish. And why not modernize the baked beans by generously adding them to your avocado toast? This is such a simple trick when repurposing a meal you've made in bulk, giving it new life. And this recipe sums up a motto I like to live by: When in doubt, put it on some avocado toast. In a large skillet, warm the olive oil over medium heat. Add in the shallot and garlic and cook, stirring frequently, for about 7-10 minutes. Add the canned tomatoes, seasoning, chili flakes and salt. Lower the heat to a simmer (stir often) until a thick sauce forms, about 10 minutes. Once it's cooked, stir in the beans and mix well to coat. Pour the tomato beans into a medium-sized baking dish and cook for 25-30 minutes. Pull the baked beans out of the oven and sprinkle with the ricotta. Put it back in to the oven and cook for another 5 minutes, until the ricotta has slightly melted. Top with the parsley/cilantro and enjoy the baked beans as is or over toast! Take a slice of toast, layer on the baked beans and then the avocado. Top with sea salt, black pepper, squeeze of lemon and enjoy!